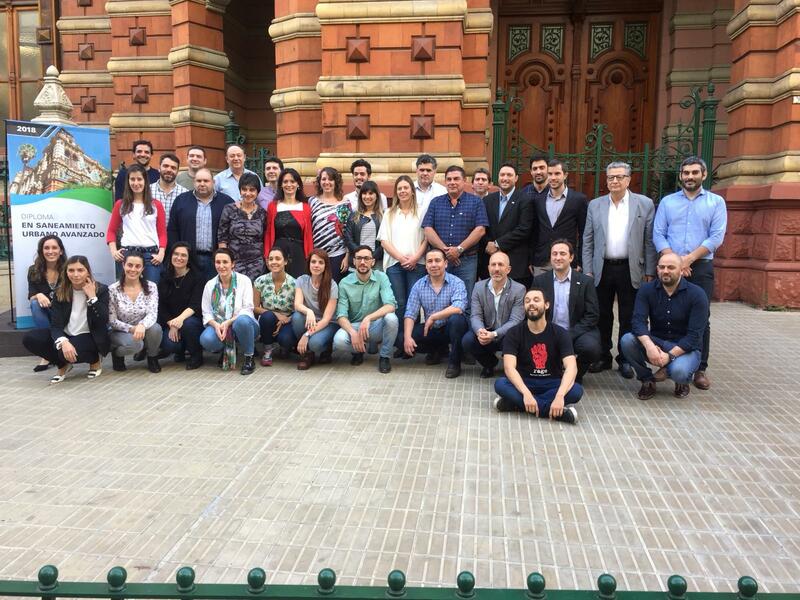 In September the first IHE Delft Advanced Urban and Sanitation Diploma concluded in Buenos Aires, Argentina, with the attendance of 33 Argentinean water professionals. The Diploma is the first result of an agreement signed in April in Delft between AySA (Agua & Saneamientos Argentinos SA) and FUTRASAFODE (future Argentinean University for Water and Sanitation). The Diploma aims to update Argentinean water professionals with the latest developments in the field of water and sanitation. The agreement includes the delivery of two cohorts Diploma students in 2018 and 2019; each Diploma consists of nine short courses that were and will be delivered by academic staff from the Environmental Engineering and Water Technology Department of IHE Delft. The first cohort started in May 2018, coordinated by the Sanitary Engineering core led by Professor Damir Brdanovic. Thirty three water professionals from different Argentinean organizations such as AySA and the Ministry of Public Works successfully completed the course. On the last day of the first Diploma a closing event and alumni gathering took place to celebrate the achievement. Dr. Luis Liberman and MSc Gabriela Sacco (representing FUNDAPROE), and Dr. Hector Garcia and Ms. Maria Laura Sorrentino (from IHE Delft), explained the initiative and the course to the audience. More than 60 persons attended the closing ceremony, among them representatives of the Argentina diplomatic community, authorities of AySA and the Sanitary Engineer Union, IHE Delft Alumni and representatives of the Netherlands Alumni Association of Argentina, ACANED. Certificates of attendance were given to all participants and three students shared their experiences of the course, underlining the importance of the new knowledge gained, technologies learned, new possibilities and the positive interaction among colleagues of different institutions that the course facilitated. Participants will obtain their diplomas next December after completion of the exams, and they will join the IHE Delft alumni community. The next Diploma will start in March 2019 and will be open to 40 new Argentinean water professionals. FUNDAPROE, Argentinean University Institute for Water and Sanitation, is a new educational institution that will be accredited and start its programmes in 2019. The University, located in the Palace of Water of Buenos Aires, aims to be a significant player in Water and Sanitation education in the country and the region. In the future, a double MSc degree diploma will be developed by the University and IHE Delft.